Audi’s fastest car, the R8, was recently promoted as the car for fast drivers and fast readers in an iPad advertisement developed by AlmapBBDO Sao Paulo. 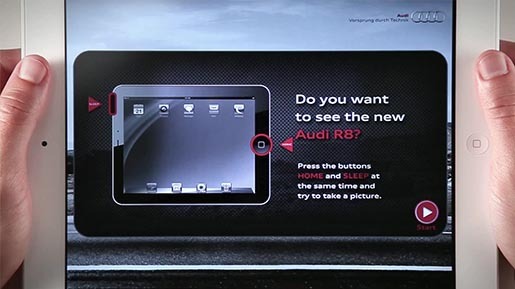 The ad, featured in digital magazines in Brazil promoted the R8’s main differential: the speed. 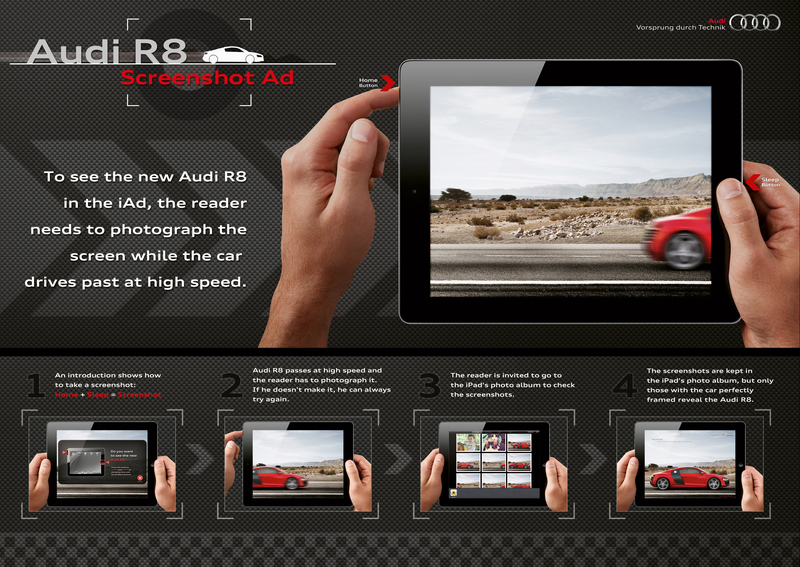 To see the new Audi R8, readers needed to photograph it using the iPad’s screenshot feature. While the car passes by in high speed the reader must press the buttons HOME and SLEEP at the same time to take a picture. Only the picture taken at the exact moment when the car is in frame reveals the Audi R8 completely. More than an interactive ad, this was an Audi ad saved amongst the personal photos of readers. The Audi R8 Screenshot was developed at AlmapBBDO, Sao Paulo, Brazil, by chief creative officer Marcello Serpa, executive creative director Luiz Sanches, creative directors Marcos Medeiros, André Kassu, Bruno Prosperi, Renato Simões, art directors Andre Sallowicz, Denis Peralta, copywriters Filipe Medici, Rodrigo Resende, programmers The Goodfellas, technology director Fernando Boniotti, account team Fernanda Antonelli, Carol Derra, Isabela Filippi, Lucas Nunes, media team Paul Camossa, Flavio de Pauw, Isabela Albero, Renan Magri, working with Audi Brasil CEO Leandro Radomile.